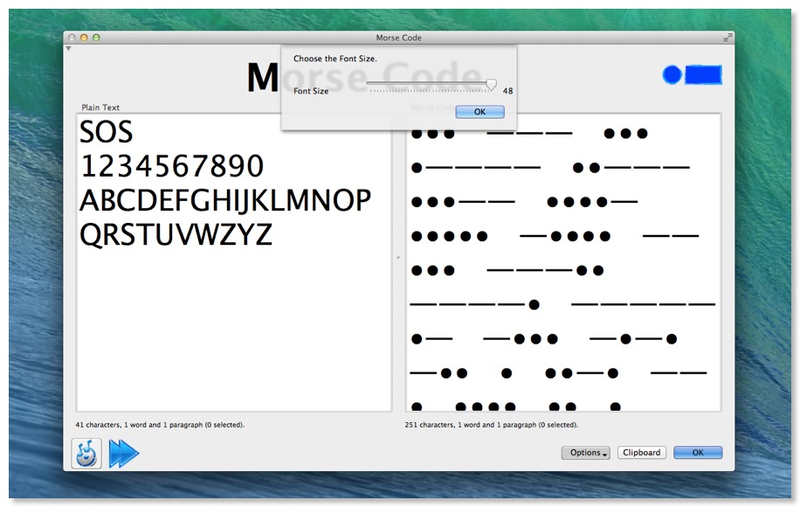 Morse Code is a utility to translate plain text into the dots and dashes of Morse Code. Type the text you want converted into the left box. Click the OK button to convert the text into Morse Code. It handles most letters and numbers plus a limited range of symbols. Each Morse Code 'letter' comprises a series of dots '•' and dashes '—'. These 'letters' are separated by three spaces. Words are separated by seven spaces. 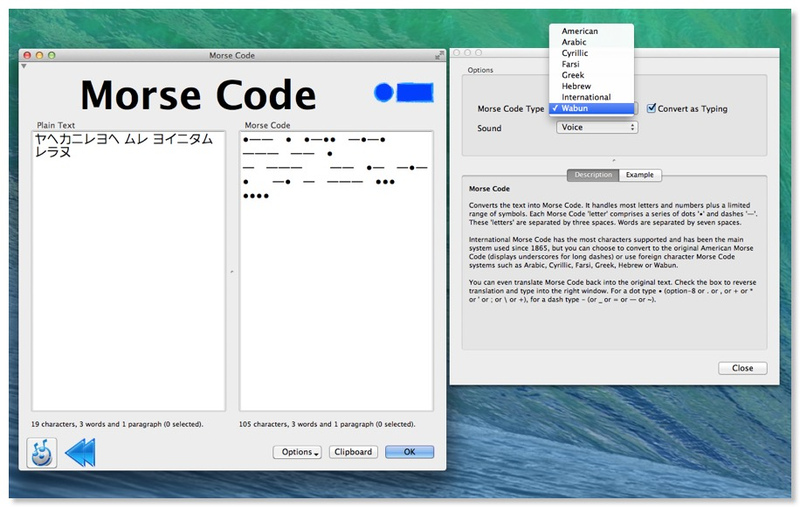 International Morse Code has the most characters supported and has been the main system used since 1865, but you can choose to convert to the original American Morse Code (displays underscores for long dashes) or use foreign character Morse Code systems such as Arabic, Cyrillic, Farsi, Greek, Hebrew or Wabun. You can even translate Morse Code back into the original text. Morse code began in 1836 when the American artist Samuel F. B. Morse, the American physicist Joseph Henry, and Alfred Vail developed an electrical telegraph system. This system sent pulses of electric current along wires which controlled an electromagnet that was located at the receiving end of the telegraph system. 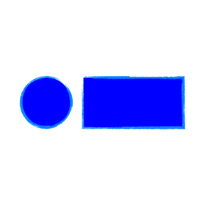 •	Click the blue arrow to reverse the conversion. 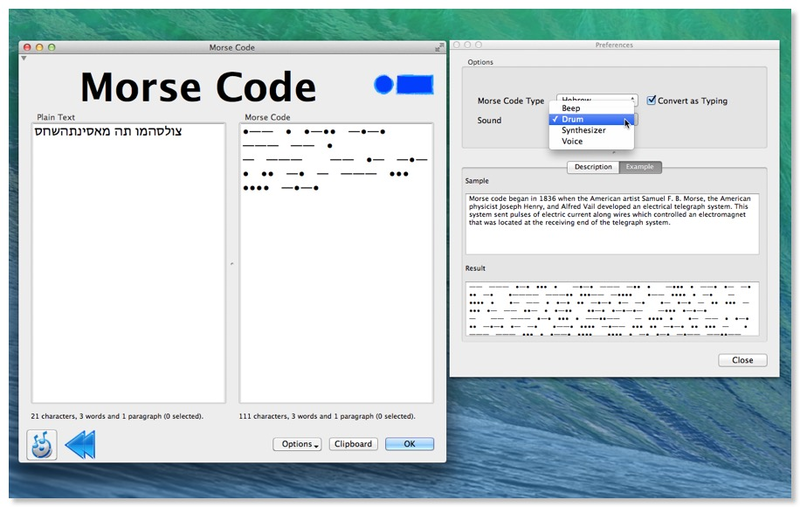 This allows you to convert morse code back into plain text. •	Morse Code translated to plain text is formatted as sentence case automatically since Morse Code has no upper or lower case. •	Get the computer to speak the plain text or the Morse Code text. •	Morse Code text can be spoken as dot & dash beeps, different drum beats, synthesizer or spoken voice sounds. 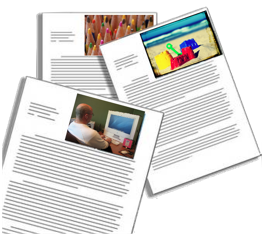 •	Change the font size of the text. 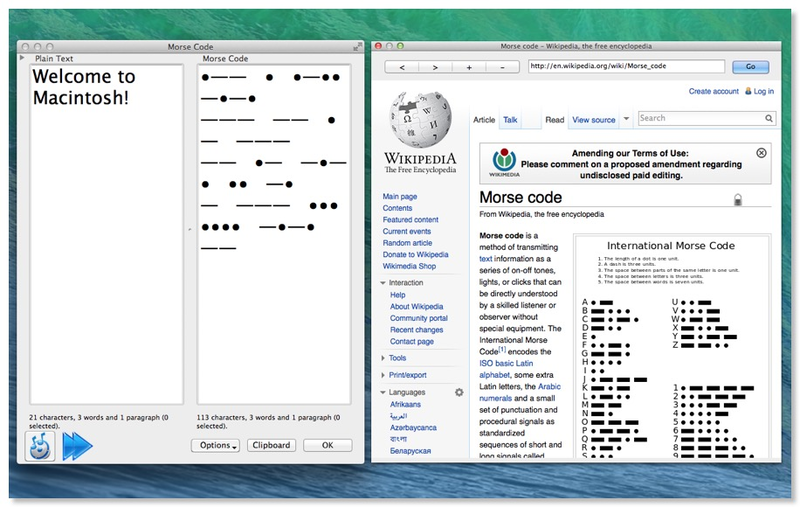 •	Display the Wikipedia article describing Morse Code. 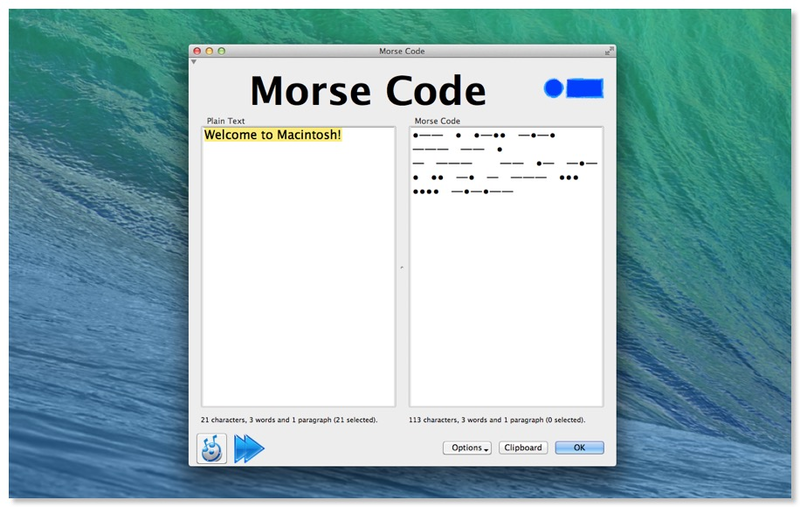 •	Convert text to Morse Code as you’re typing or only when you click the OK button. •	Copy the Morse Code to the clipboard by clicking the Clipboard button. Use it fully five times each launch. If you like the program, please purchase it from PayPal below. You will be emailed a Serial Number within 24 hours. [New] Font size can now be up to 48 points. [New] Windows can now display full screen.